A quick post because I wanted to share this a project that was finished earlier this year. 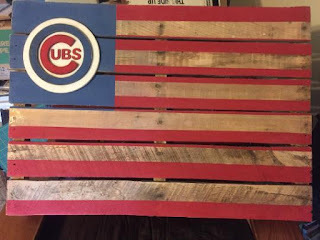 My DH put the boards together last year and I painted the blue square and red stripes shortly after. Then I STOPPED (because I could not decide what to do with the blue square...one star, nine stars, decisions decisions) and stored it behind my chair. Then inspiration struck me while on Pinterest (of course) and I was able to finish this beauty. The white circle was bought at Michael's (unpainted) and the UBS was bought at Hobby Lobby...I think. I cut the blue circle and the C out of plywood with a little help from my baby brother. They aren't perfect but with the help of sandpaper it turned out pretty darn good. I am so glad I waited to finish this project until it all came together. My nephew is a proud Cubs fan in a family of loyal Cardinals, so he was the the lucky recipient! What an awesome project this is! 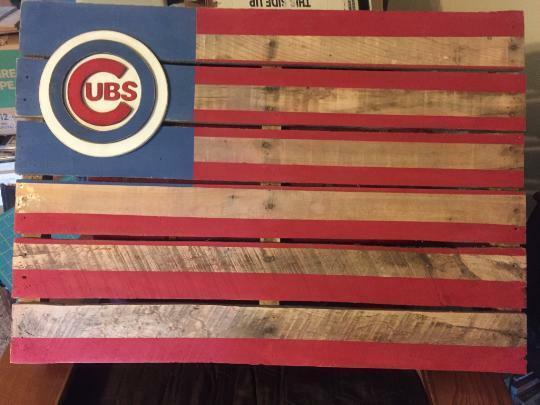 I love the Cubs logo in the flag field - cool idea! Your nephew is a lucky guy. I think it looks fabulous. Great project and a lot to be proud of. Enjoy the week.